I thought I would show you what Gamma (Jean), who is Babes Mum, therefore my mother-in-law and the Princess's grandmother (all that detail so that you are clear on who she is!) made the Princess for Christmas. I can't believe she made it, well I can because she is very clever . 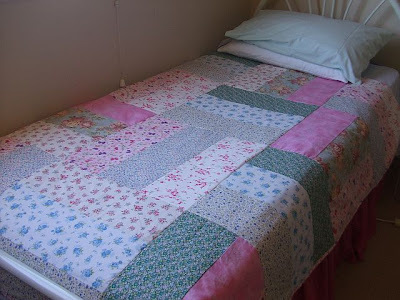 . . anyway, its this gorgeous, shabby chic, girly pretty, comforter for the Princess's bed. 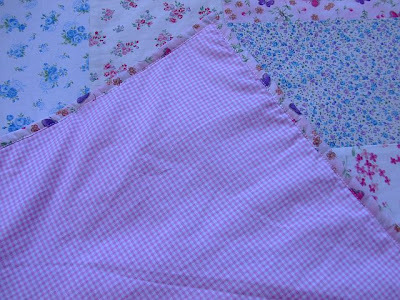 The underside is pink gingham, so pretty! Its all I need on her bed at the moment because it is so warm here at night. In the winter I will fold it and have it sitting on the end of the bed. A few posts back I showed you my Christmas presents, well here is a close up of the ornamental shoe Gamma gave me. Isn't it stunning! 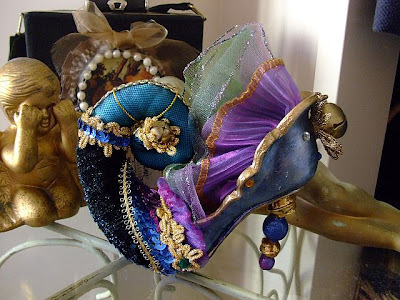 The heel and body part of the shoe are ceramic, the toe and embellishments are all fabric, braids and lace. It has sewn a seed, thinking, thinking . . .
We are having a great summer, its hot, hot, hot here right now, just lovely, we have our little pool up and the Princess and I have been having fun playing in it and cooling off. Our children don't start back at school until early February. I am loving having the Princess home, no getting up early, getting dressed early or making school lunches!!! Bliss or as my best friend Mary Thistle says "Heaven on a Stick". I am off to bed, a big day tomorrow, stuff to do, places to go, people to see . . . you know how it goes . . .